Hungry Jacks new Stockton Delivery Hub is the latest Sponsor to come on board here at Stockton Town. To launch the new sponsorship Hungry Jacks and Stockton Town will be running a number of competitions over the coming weeks to give you a chance to win prizes and match tickets. 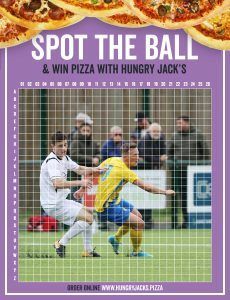 Our brand new SPOT THE BALL competition in association with Hungry Jack’s Pizza. Every Wednesday we’ll be publishing a photo from one of our matches and asking you to spot the centre of the ball. Everyone who identifies the correct square in the comments section will be entered into a competition to win two 12″ pizzas and 2 tickets to our next home game. The competition closes at 9am Saturday and the winner will be announced soon afterwards. 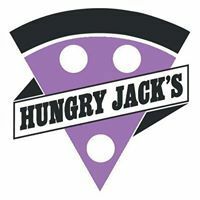 Make sure you don’t miss out on your chance to win by following and liking Hungry Jacks on their Facebook page or if your looking for a home delivery order on line at Hungry Jacks.